Hide this Project (Sankalp Serenity) Discover properties in other projects by hiding the ones that doesn't interest you. You won't see them in your searches further but you can unhide anytime later. Sankalp Serenity is one of the residential developments by Sankalp Organisers, located in Ahmedabad. It offers spacious and skillfully designed 3 BHK apartments. The project is well equipped with all modern amenities and 24 x 7 security service to facilitate the needs of the residents. What is the project location?The project is located at Thaltej, SG Highway & Surroundings. What size of flats are available in Sankalp Serenity? The apartment size in the project is 2100.0. 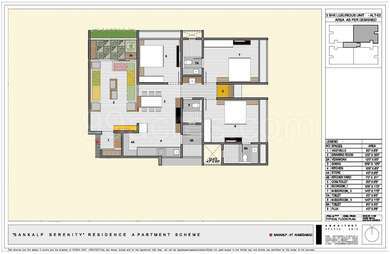 How much is area of 3bhk in Sankalp Serenity? The size of 3BHK units in the project is 2100.0 sqft. How much is the actual area of Sankalp Serenity?The area of the project is 0.05 Acres. What is the price of 3 bhk in Sankalp Serenity? 3 BHK units in the project are available at a price tag of Rs. 15000000 to Rs. 18000000. What is the price of flats in Sankalp Serenity? Average unit prices in the project stand between Rs. 15000000 and Rs. 18000000. Sankalp was founded in 1981 by the visionary Shri Ramavatar Goenka who started company's first flagship restaurant in Ahmedabad. Presently there are around 100 restaurants in India and abroad. Sankalp's rich legacy has extended in the last decade in the field of construction under the banner "Sankalp ? Robin Goenka Group". Mr. Robin Ramavatar Goenka ? CMD ventured in the real estate sector in 2005 a big way to set a benchmark in real Estate business. esulted in various commercial, Residential and Industrial Plotting projects as well as dealing in land in the Metro city Ahmedabad, Gujarat. Sankalp Group has come up with Commercial projects at Maninagar, Gurukul as well as several high-end residential projects Sankalp Grace at Rajpath Club, Sankalp Sapphire at Prahladnagar, Sankalp Grace 2 at Ambli Bopal Road and Sankalp Serenity at Sindhu Bhavan Road. These are just 5 minutes drive from the posh and upmarket commercial hubs of S.G. Road and Sankalp Sandipani etc. They are among the best places for those hunting for peaceful abode as well as a lucrative investment with maximum returns in the mega city of Ahmedabad in Gujarat. Each of Sankalp's projects is managed by a team of professional and qualified architects, consultants and contractors. The team is committed to achieving high level of customer satisfaction through timely execution completion of all projects. Much effort is put in to make the residences luxurious as well as convenient with well-equipped multi gym, Children play area, Senior citizens sit-outs, all amenities are provided to cater to all age groups. In the posh apartments from drawing to dining, puja to kitchen, study to music as well as bedrooms, the minutest detail is taken care of. This validates the Company?s mission ~ to create a better lifestyle for people. Hi, I am interested in this project . Can u tell me when the project would be starting and what would be the possession date...??? Hi Amit, construction has been going on , you can visit the site and explore. You will get its possession by December 2015.
i am staying an working in Dubai. I want to buy it on loan. how do you help me in that matter ? the property is a loanable one .....you will not face a single problem regarding loan matters.